In the run-up to the 2018 midterm elections, right-wing media and Republican officials have found a new favorite scare tactic: hyping nonsensical claims of radical Democrats and an “angry mob” of “scary,” violent, liberal protesters trying to disrupt American values and take over the country. 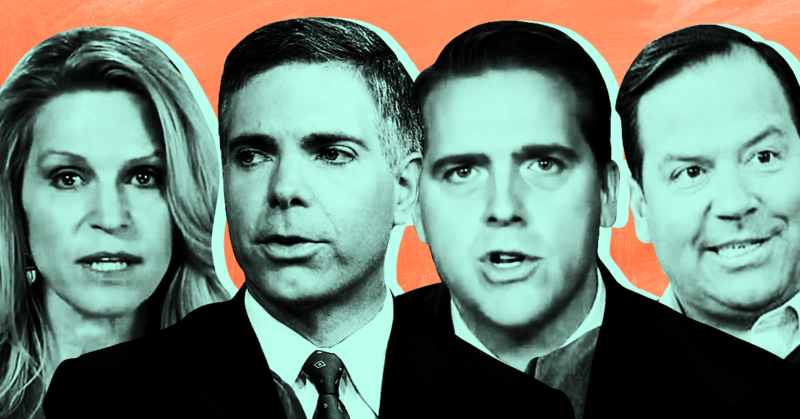 This transparent effort at turning out Republicans to the polls has been parotted by a number of right-wing pundits paid by CNN for their political analysis. There is, of course, tremendous irony here; CNN hired Corey Lewandowski as a political commentator after Lewandowski was forced out of the Trump campaign for assaulting a reporter. CNN was also duped by conservatives earlier this year into fretting over “civility” as it conflated examples of liberals being rude with conservatives being racist. CNN’s model of false balance and “both sides” punditry and its obsession with employing and hosting a roster of right-wing ideologues is nothing new, but it does continue to lead to the espousal of extremist opinions on the network. 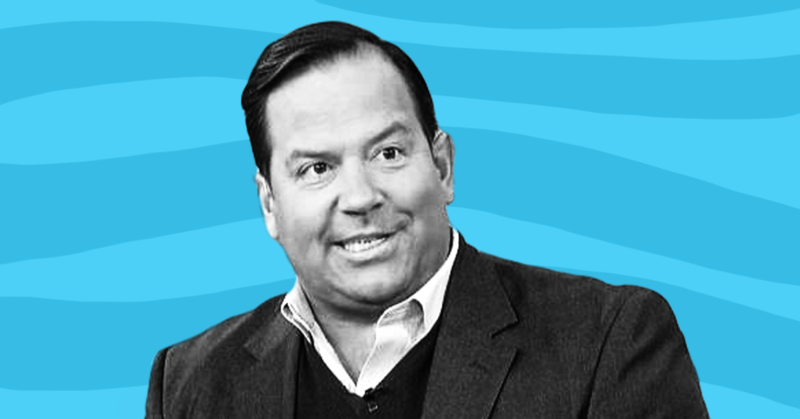 Pro-Trump pundit Steve Cortes says he went “to CNN partly at the suggestion of the White House itself and the president himself"
Cortes joined CNN despite previously criticizing the network as “fake news” and attacking both on- and off-air CNN employees for alleged bias against Trump. His commentary for CNN is unsurprisingly a parade of misinformation and over-the-top support for Trump. JEFF CROUERE (HOST): Steve, my condolences for having to work at CNN and my real, just -- my heart goes out to you and I just want to know how in the world, Steve, can you do that? STEVE CORTES: Right. Well, it’s a very different job. I used to be at Fox News, which was a whole different world. I went over to CNN partly at the suggestion of the White House itself and the president himself because -- and I wanted to do it also because I saw a narrative there that I thought was unfair to the president, and I want to try to be a counter voice. I want to be an alternative voice on CNN and I hope a voice of reason. So I hope that I am over there, to put it in sort of religious terms, I hope I am winning over some pagans. And some of the unchurch folks. 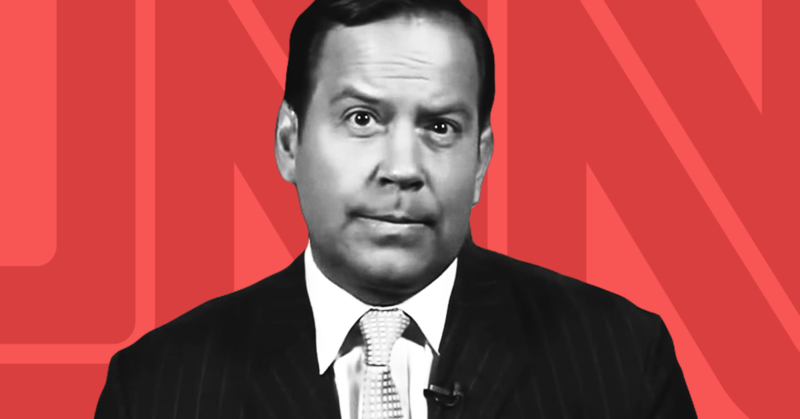 While Cortes said that “CNN has been great to me,” he agreed with host Jeff Crouere’s criticism that CNN’s guest lineup is unfair to Trump. STEVE CORTES: And honestly, I will say this. Look, CNN has been great to me, has certainly given me a platform. I like a lot of the people there even though I clearly don’t agree with what they say on air. But, for instance, today I’m going to be on three times and, believe me, I’m going to be advocating strenuously for the president’s position and for the renewal of this country, which I think is already happening and is going to accelerate going forward. JEFF CROUERE: Well, let me congratulate you on working in that environment and being able to put up with all of that. Whenever I see a CNN panel it’s like one token conservative surrounded by four or five liberals. CROUERE: Or they’ll have some Never Trump Republicans on there who hate the president even more than the Democrats do. CORTES: Right. And that often happens. Right. CROUERE: And it just seems like it’s totally skewed and unbalanced. 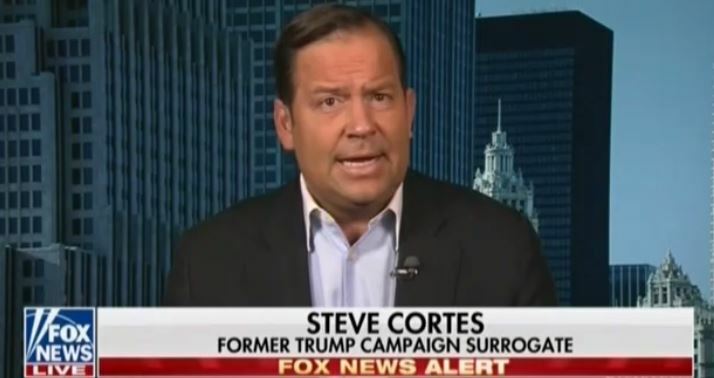 CORTES: If it’s a four-person panel they’ll say it’s two Republicans and two Democrats but the problem is at least one of the Republicans despises President Trump. The New York Times Magazine's Jonathan Mahler reported last year that after Trump appeared on Anderson Cooper 360 in 2015, the Republican "complained to CNN that his interviews on the network were always followed by conversations among panelists who all seemed to hate him. The network asked Trump to suggest the names of some people who would defend him. One of those whom he mentioned was Jeffrey Lord. … Lord made his CNN debut in July 2015. Two weeks later, CNN offered him a job as the network’s first pro-Trump contributor. (CNN said it was already considering Lord and that Trump’s suggestion had no effect on their decision to hire him. )” CNN fired Lord in August 2017 after he tweeted a Nazi salute at Media Matters President Angelo Carusone. Media Matters asked CNN for comment on Cortes’ remarks about his hiring but did not receive a reply. On March 6, the Department of Justice (DOJ) filed a lawsuit against the state of California, Gov. Jerry Brown, and California Attorney General Xavier Becerra, claiming that three of the state’s immigration laws violate the supremacy clause of the Constitution. 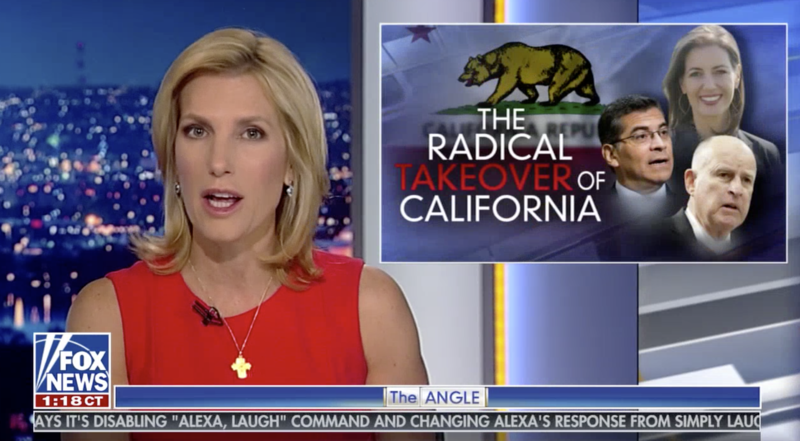 The lawsuit is the culmination of an ongoing battle between California and the federal government over the latter’s anti-immigrant policies -- a battle in which Fox News is playing a crucial role. For years, Fox has repeatedly accused California lawmakers of “placing illegal immigrants and illegal activity over citizens” and violating federal law. Now, the network is using the administration’s very own talking points and propaganda in an attempt to tip the scales in the lawsuit. Fox host Harris Faulkner and Fox News contributor Steve Cortes have both adopted Attorney General Jeff Sessions’ bizarre talking point comparing California to states that seceded during the Civil War. Fox is also digging in on its long-running false narrative that undocumented immigrants pose a public safety threat to average Americans to justify the DOJ’s claims. Even a Fox correspondent who, presumably, should report the news without bias characterized undocumented immigrants as “fugitives” who “remain at large.” CNN has reported that ICE has recently added “ICE fugitives,” which originally referred to people with final orders of deportation, to the category of “convicted criminals,” allowing the agency to misleadingly claim that 92 percent of immigrants arrested under Trump had criminal convictions when in reality that number is closer to 70 percent. And while Fox has criticized California laws that prohibit local law enforcement and private employers from cooperating with ICE, the network has made little mention of a third aspect of the DOJ lawsuit that aims to prevent California from overseeing federal immigrant detention centers, which are rife with human rights abuses. This is unsurprising given the network’s indifference to the mistreatment of immigrants in detention. While Fox News has long been a purveyor of false information surrounding immigration, the network has of late taken a decisively aggressive and propagandistic tone in the spirit of advancing the policies of a fiercely anti-immigrant administration. Fox’s Brian Kilmeade: "That’s the new buzz, white supremacist"